It is difficult today, some forty-three years on, to appreciate the impression that Guy Lyon Playfair’s first book, The Flying Cow: Research into Paranormal Phenomena in the World’s Most Psychic Country, achieved on its publication in 1975, especially within the rather reserved and sedate world of psychical research (at least as typically practised and preferred by many members of the Society for Psychical Research at that time). 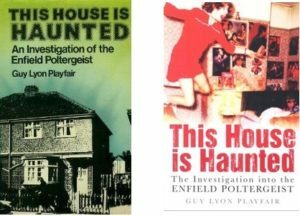 Although his classic work, This House is Haunted (1980, 2012) on the Enfield Poltergeist, remains Playfair’s best-known book, it was the reception to this, his first and, in many ways, most challenging work, that fixed him on his lengthy career in the field. The Flying Cow asserted that that dramatic and particularly physical psi manifestations were a daily occurrence in contemporary Brazil and sought to refute the prevailing attitude that such phenomena, if they ever existed, were a thing of the past. More significantly, it was the immediate positive reception that the book received from the wider public that exerted the greatest influence on Playfair’s decision to become a full-time researcher and writer on the paranormal and physical phenomena particularly. It is a decision that he never regretted nor repented, and is the point from which his subsequent life and career should be traced. That his first book should have made an impact was in many ways not surprising, thrusting its readers into what Playfair termed the ‘world’s most psychic country’ and ‘the most psychically orientated country on earth, where nothing can surprise anybody’ (suggesting the title which reflected how even a fantastic claim, such as a flying cow, would not be automatically dismissed but questioned seriously). On page after page, he presented readers with detailed accounts of extraordinary Brazilian cases that were all wholly new to readers in the English-speaking world covering physical mediumship, reincarnation, feats of levitation, cures achieved by psychic surgery and some aggressive poltergeist manifestations. These last challenged the prevailing theory that poltergeist disturbances were, if genuine, attributable to Recurrent Spontaneous Psychokinesis (RSPK) originating in the unconscious minds of adolescents and which were usually harmless. The accounts supplied and Playfair’s own testimony of personally witnessing and recording a poltergeist in action in 1973 rebutted this generally accepted opinion. 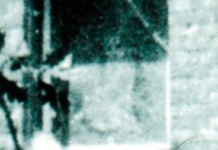 Even more controversial was his bold assertion for the proposed cause of poltergeists, arguing that it ‘seems time they were more widely accepted outside Brazil for what they obviously are – bad spirits’. These extraordinary accounts were presented, not as a collection of travellers’ tales, but as cases supported by documentation and cogent evidence. Many had been actively pursued in a scientific manner by a band of dedicated and serious researchers in Brazil: the Institute for Psychobiophysical Research (IBPP), with whom Playfair had become involved. In addition to vouching for the evidence for many of these claims, he maintained that these extraordinary phenomena in Brazil and were open to testing and further study, and even a measure of repeatability, and that they were in keeping with records accumulated by psychical researchers in the past. 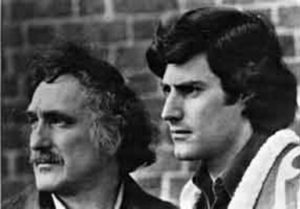 Although there was much happening in terms of parapsychological research at the time, nothing quite as dramatic or spectacular had been credibly reported in Western Europe for several decades, save for the phenomena of Uri Geller and the mini-Gellers, the metal bending-teenagers who followed in his wake. Feats of physical mediumship were considered to be largely confined to the past, seemingly vanishing after the introduction of infra-red photography and instances of psychic surgery were largely considered deceits by clever conjurers. In short, The Flying Cow declared that physical phenomena were a reality and awaited proper investigation. The book was a manifesto for psychical researchers to drop often reflexive, pre-existing prejudices, cease debating the past and to apply its lessons in practical laboratory and field studies in the future. Pointing to the remarkable progress that had been made in computer technology and space travel, and how science fiction had become daily events within a few years, the book ended by optimistically predicting major dividends in terms of positive results by the end of the 1970s, if only well-funded and enthusiastic experimentation got underway. He could have benefited from a study of Dr A. R. G. Owen’s Can We Explain the Poltergeist (Helix Press, New York, 1964) before embarking on a chapter on poltergeists with the statement (p. 251) about spirits. This is not at all obvious to me nor will it be to many readers of this Journal. Nor was there approval of his linking of these reported phenomena with the mediumship of D. D. Home and Eusapia Palladino, it being felt that distinctions should be made ‘since Home was never caught cheating’. Polite head-shaking continued when Playfair visited Britain to promote the book and take up lecturing invitations that had followed. As he observed, ‘Mention of spirits invariably polarises people into either fanatical believers or total sceptics’, with the resultant arguments resulting in research inertia and a disinclination to put claims to the test, certainly if as far afield as Brazil. Fortunately for psychical research, the wider reading public felt differently. The book was received with interest and even excitement. I was just one such enthusiastic reader, then aged twelve, acquiring a copy via my disapproving Suffolk grandfather, who was nonetheless amused by the title of the book. The interest was reflected in sales and the book went into several editions, including with far less provocative title The Indefinite Boundary. For Playfair, a large part of the commercial success arose from the hard currency earned from royalties going much further in Brazil where he had worked for fourteen years. 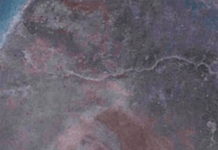 I was once woken by some deafening thumps on the ceiling of my house in Rio de Janeiro, where I lived for many years. They were repeatedly regularly and were caused, as I eventually discovered, by a little nocturnal mammal called a coati that hops up and down like a mini-kangaroo. I cut off the branch of the mango tree that brushed against the roof and slept soundly from thereon. However, a health problem with his digestive tract led him to take up the suggestion from actor Larry Carr to try a psychic surgeon, who conducted an ‘operation’. Intrigued and impressed by both the experience and the improvement in his condition, he joined a small group of spiritists active in Rio looking at further instances, being surprised by the dossiers of well-evidenced reports and case investigations covering a wide spectrum of phenomena. Concerning involvement with the group, Playfair remarked that ‘They say that when the pupil is ready the teacher arrives’ and for him this proved to be the Brazilian civil engineer Dr Herman Guimaraes Andrade (1913-2003), who had founded the IBPP in 1961. Having the opportunity, not only to observe the group, but also participate in their investigations, he set about gathering evidence himself, using techniques and practices engrained through years of journalistic enquiry. 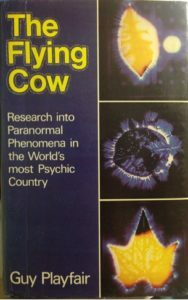 Swiftly becoming convinced by first-hand testimony and corroboration, as well as personal experience, that inexplicable phenomena were taking place in a number of cases, he brought out The Flying Cow. Following these experiences and the favourable public reception of the book, Playfair stated that ‘There was no turning back to writing stories about hydroelectric dams, the balance of payments, or sewage treatment’. He took the decision to become a full-time writer and researcher in the field of the paranormal. Thus, the book with a bizarre title proved life-changing, as well as laying down the main directions of research and scholarship that he followed for the rest of his life. He took a position of following the evidence wherever it led, being prepared on occasion to change his mind on cases that he had previously dismissed, maintaining the view that it is the totality of evidence that matters, not any one isolated strand. His approach was demonstrated by his reversal of opinion in one of his first forays in international investigative work for which his residency in Brazil uniquely qualified him in finding a solution. This was an in-depth examination of a curious story carried by Psychic magazine that a Brazilian banknote had materialized at the home of scientist Dr Andrija Puharich in the USA, thousands of miles away, following a personal visit by Geller. Playfair obtained the serial number of the low-value note and traced the issuing mint in Brazil, concluding that the most likely explanation was that it had acquired by Puharich on a tourist visit in the early 1960s and subsequently forgotten. His account of his investigation and sceptical verdict was published with approval in the New Scientist and also in The Magic of Uri Geller (1975) by sceptic conjuror James Randi. However, never being one to let a question rest, Playfair himself came to doubt the cogency of this explanation when some years later he conducted further interviews with Puharich and also had the opportunity of testing Geller in person. He became convinced that Puharich had reported the incident in good faith and had been unjustly maligned: he was labelled as ‘going ga-ga’ by Stan Gooch, for example. Concerning Geller’s phenomena, he became a convert after witnessing examples, both in tests and spontaneously, in addition to his own background research, extensively trawling records and tests going back many years on both sides of the Atlantic. He stated that ‘I became convinced of something many had learned before me: inexplicable things do happen in the presence of Uri Geller’. Of his philosophy he stated: ‘I have never chosen to ignore any evidence for or against anybody’. But this came more than ten years after the success of The Flying Cow. Feeling that psi was now the correct path back in 1975-76, Playfair decided to abandon the often privileged life of a foreign correspondent to take up the more precarious one of a freelance writer on the paranormal in Britain, also recognising the better prospects for investigating psi globally, if based in the Northern Hemisphere. Further advantages came in his gift for languages – he could speak Portuguese, French, Spanish and Russian – and being able to work independently of academic and institutional constraints. Settling in London full-time in 1976, he eventually moved into a one-bedroom flat situated in Earl’s Court Square, London, which was to be his home for the rest of his life. Purchasing a lease when the whole building was run down and semi-derelict, he set about painting, decorating and restoring and when finished did not do it again, being able to withstand what to many seemed a rather spartan, even monastic life, with a minimum of furnishings and personal effects. His main concern was building up a working library of books, classical music and a collection of musical instruments (he played the trombone, the piano and the harpsichord). Further decoration was provided by ornaments and curios brought from Brazil, and paintings by various psychic artists. He later also added spoons bent out of shape by Uri Geller. His flat also provided a convenient base from which to visit the offices and library of the Society for Psychical Research and for attendance at its lectures, and also for visiting the College of Psychic Studies. 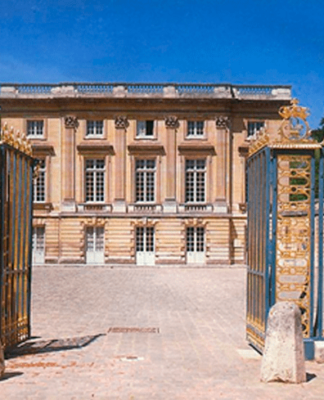 It was also a central place for meeting visiting scholars and individuals, sometimes also hosting meetings of the SPR and other committees. It was from this Earl’s Court flat in 1978 that he set out for many nights of observation during the outbreak of the Enfield poltergeist which had begun the previous August, a case reported to the SPR by the Daily Mirror and followed up by the late Maurice Grosse. There are those, we have found, who are prepared to believe in psi phenomena provided they happened a long time ago and preferably in another country. The suggestion that they happened yesterday evening right here is less welcome. Notably, Playfair did receive the backing from one veteran member of the Society, Dr Ε. J. Dingwall (1890-1986), who had a reputation as a highly sceptical investigator of physical phenomena for more than fifty years. They had first corresponded after The Flying Cow had been published and they became friends. In response to unexplained knocking sounds at Enfield Dingwall, gave positive endorsement to them taking a cautious experimental approach by urging them ‘to rap back’. Much analysis still remains to be conducted on the data accumulated in the Enfield case, but there are three clear lessons from it with which Playfair concurred. Firstly, as a positive case it has stood the test of time. Unlike Borley, there has been no widespread accusation of trickery and even the most resolute sceptics backed away from trying to brand either Playfair or Grosse as fraudsters. There has been never been any demolition of the case published beyond blanket claims that the ‘girls were playing tricks’. On Enfield, sceptics are reduced to parroting selective quotes, promoting unproven allegations and implying a conspiracy for which no evidence has been put forward. Secondly, the phenomena were capable of being seen by outside observers (William Roll made the same point about three of his cases) and an experimental approach to a limited extent can be adopted in such outbreaks. The evidence is there of many unexplained things having been observed taking place; the problem is an abundance of evidence, certainly more than is routinely needed to convict a person in a court of law, even for some of the most serious offences in the statute book. Thirdly, it is regrettable that psychical research, established as a science, still has trouble responding to such phenomena, which leave objective forensic traces in different forms. An overall assessment of evidence needs to be conducted that draws upon experts from different disciplines. And regarding this aspect, one of the curiosities that remains about the Enfield is the reluctance of mainstream science and critics to engage with the data. Sceptics and even psychical researchers have failed to engage with the material accumulated. This suggests a psychological resistance on some level, as both Grosse and Playfair proposed in their 1988 article. 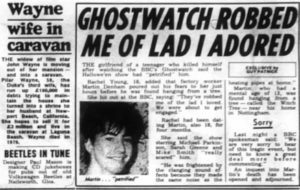 Attached to the Enfield story and This House is Haunted is also a persistent cultural legacy: the case has continued to periodically attract interest from the popular media, regrettably all too often more concerned with sensation rather than factual accuracy. The story inspired a notorious BBC 1 televised hoax, Ghostwatch, in 1992, for which Playfair launched legal action against the BBC, bringing a civil claim for copyright infringement. This was settled out of court. 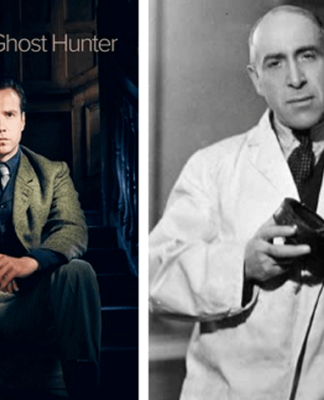 His role as one of the two principal investigators at Enfield conferred upon him celebrity status within ghost-hunting circles and made him a regular point of call for the media. As it happened, Playfair had a great dislike of television as a medium, seeing it as largely negative in its effects on the human mind, to the point of condemning it as a dangerous narcotic. 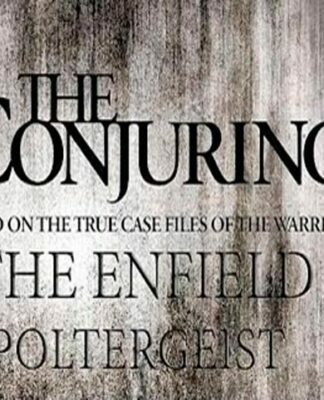 More recently, it provided the inspiration for a TV series, The Enfield Haunting (2015), and a film, The Conjuring II (2015), which was only very loosely based on fact, if at all. My book This House is Haunted about what has become known as the Enfield Poltergeist, was first published in 1980. It did quite well. But sales dried up, as they do, and I failed to interest a publisher in a reprint. Poltergeists it seemed were so 1970s. Then in the early 2000s, various production companies started offering to buy the film rights. A serious sounding proposal came from Sky. Best I could hope to get. My first meeting with the production team went well, there seemed to be agreement. Heads nodded when I said my true story didn’t need over the top effects that tend to ruin films about things like poltergeists, at least in the opinion of those who have actually had first-hand experience of such things. Sky’s three-part mini-series The Enfield Haunting promised at the start that it was ‘Based on Real Events’. The first few minutes were encouraging – a minor incident was shown as it had really happened – but I cannot claim authorship of any but those first few minutes. What followed was excellently acted by an all-star cast, but light years away from the facts. The usual special effects clichés were trotted out. When I later asked the producer why he hadn’t shown any of the real stuff instead, his reply was ‘nobody would believe it’. The secret of good television, he revealed, is that it has to look good. It did look good and was surprisingly well-received. Yet an alarming number of people, to judge from the avalanche of e-mails I received, seemed convinced that Sky’s version was my own. One viewer wanted to know how I felt being levitated up to the ceiling? I couldn’t say, because the actor playing me was, I wasn’t. Oh well. As one of the Dimblebys has been quoted as saying, ‘Television vanishes in the night’. Books don’t. Important as the Enfield case proved to be – effectively taking up three years of his life – Playfair ultimately felt that it had often eclipsed his other work, particularly in three areas: abnormal hypnotic phenomena, twin telepathy and taking an experimental approach to physical phenomena. These subjects occupied him from 1980 until his death in 2018 and he wrote extensively on both, seeking to recover these subjects from the historical scrap heap and encourage new research today. 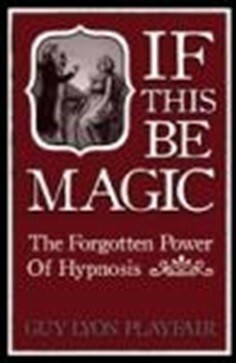 He published a study on hypnotism, If This Be Magic: The Forgotten Power of Hypnosis (1985, 2011), reviving the historical evidence for both medical uses of induced trances and detailing remarkable instances of healing. He considered this his most important book because of the medical potential of serious hypnotic treatment. Regarding experiments with physical effects in séances and what he considered cogent evidence of survival in cases of reincarnation and xenoglossy – these studies again aided by his gift for languages in travels abroad on the trail of such claims. 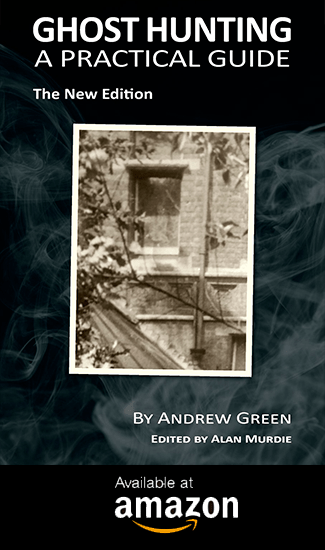 In the early 1980s, he worked with Kenneth Batcheldor and Peter Brook-Smith in PK experiments in table-turning and regularly turned out a stream of papers and articles for the SPR’s Journal, the Paranormal Review, Light (serving on its the editorial board), the Fortean Times and many other publications. He was also very pleased to have translated into English many fascinating texts on psi topics from Latin America. He was convinced that much valuable material was awaiting rediscovery in the archives left by earlier generations of psychical researchers, and from the records of their predecessors, the mesmerists and the French metaphysicians, even going back as far back as three centuries to the life and work of John Dee. He particularly rejected as prejudice the view that anything before 1870 was inherently unreliable and now only of purely historical interest, pointing out that in contrast to much modern material, such cases often proved to be better witnessed and recorded than many modern reports (points also made by Ian Stevenson and Alan Gauld). Cases should not be rejected simply because of their age, but considered as valuable sources of proof and as a source for new ideas and experiments. That Playfair had a profound knowledge of the history of each of these three areas – as well as of psychical research in general – was something that anyone who discussed these topics with him soon realised (certainly, every time we talked on any subject, I always learned something new). Indeed, in a vast subject area, it is hard to identify an issue on which he could not lecture professionally or did not have something interesting or original to say. His remarkable memory he ascribed to practising a technique of visualising information in which he was interested by way of unusual and fantastic imagery. Having turned up positive evidence in different places and times, on the subject of whether he possessed psychic powers himself, Playfair was always reluctant to say; but he certainly did not seem to have a negative effect on displays by others. He also was convinced that he had been subject to a number of very strange coincidences in his life. In many ways, he did not see these as remarkable. He saw the paranormal as normal, even stating he disliked the term for that reason. Although sometimes seeming a shade too dogmatic and acerbic in criticism for some tastes, this style was mitigated by a great sense of humour, and, if convinced of the seriousness of your inquiries, he was enormously generous with his time. He would treat witnesses with care and respect, and would openly back and encourage students and researchers, who otherwise received little support or formal backing in the field. Despite being largely housebound from 2016, he continued to explore these subjects via his computer and by an endless flow of new books and technical journals that reached him. His own dogged determination to explore the data on the source of the energy apparent in psychokinesis and the conditions necessary for its release never waned. Up until the last month of his life, which he spent in hospital, he handled constant demands and enquiries from readers and professional and amateur parapsychologists worldwide. Regarding his own terminal illness and imminent end in April 2018, he was relaxed, telling me from his hospital bed just a few days before he died that ‘I’ve put it to the back of my mind’. About the prospect of dying, he was philosophical almost to the point of nonchalance, declaring that ‘There’s a positive side to everything’. In many ways then, he was at a peace and prepared, seeing death as an adventure to come. He felt that he had lived out his destiny. Although there may be many people who may regret. in one way or another, their interest or involvement in psychical research, Guy Playfair was never one of them. Playfair, Guy (1980) This House is Haunted. Sphere Books. UK. p.85. St Clair, David (1971) The Drum and Candle. Doubleday. New York. 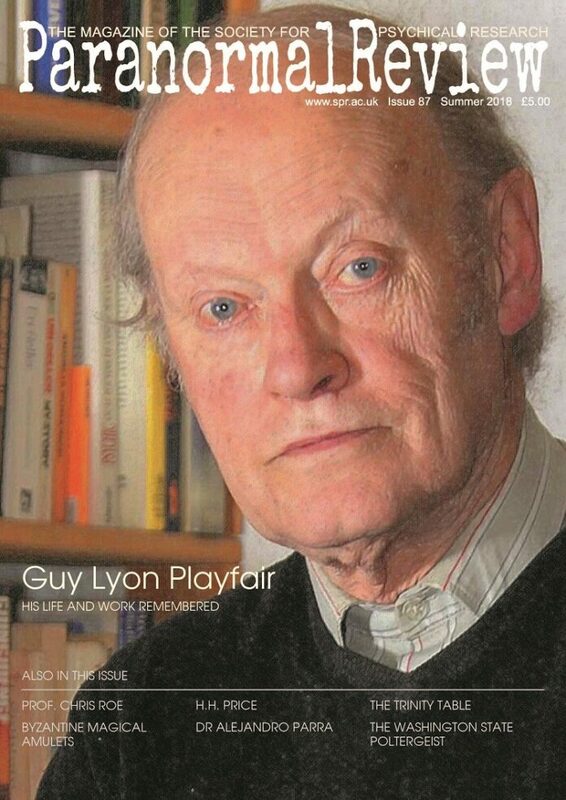 Playfair, Guy (1985) The Haunted Pub Guide. Harrap. UK. Randi, James  The Magic of Uri Geller. Ballantine Books. New York. Gooch, Stan (1978) The Paranormal. Wildwood House. London. Playfair, Guy in Journal of the Society for Psychical Research [ 1991-92] Vol. 58, No. 829 p408-409. See for example, Hoggart, Simon & Hutchinson Mike (1995) Bizarre Beliefs. Richard Cohen. London. Correspondence, SPR Journal 61, 1996, p. 191, pp. 282-4; Journal 61, 1997, p. 410; Journal62, 1998, pp. 377-9; Journal 63, 1998, p. 61. Playfair, Guy (1990) The Evil Eye:The Unacceptable Face of Television. Jonathan Cape. London. Playfair, Guy (2016) Letter in The Author (Journal the Society of Authors) Vol CXXVII No.4. Winter 2016. Playfair, Guy (2011) If This Be Magic: The Forgotten Power of Hypnosis. White Crow Books. UK. Playfair, Guy (2010) ’Adventures on the Night-Side’ in Men and Women of Parapsychology. Personal Reflections Vol 2 (edited by Zingrone, Nancy ) pp 270-280. Anomalist Books. New York pp 276-277. Stevenson, Ian (1972) ‘Poltergeists are they living or are they dead?’ Journal of the American SPR Vol 66 232-252; Gauld, Alan & Cornell A.D. (1979) Poltergeists. Routledge Kegan Paul. London.